Admission to Masterclasses and Workshops is free. Concert tickets are individually priced. Day Passes are available here. Please note that in the case of over-subscription, Day Pass holders will get priority seating for the masterclasses and competition. Download the full list of Early Music Exhibitors . A variety of instrument makers, shops and organisations will be situated in the main foyer areas throughout the festival. Royal Birmingham Conservatoire alumni and graduate from the Conservatory of Amsterdam Francesca Clements, gives an introductory workshop for teachers and performers to demonstrating how teachers can include live electronics within their music lessons. An international competition for solo recitalists aged 18 and under, with valuable prizes given by Tim Cranmore recorders, The Early Music Shop and Recorder Music Mail. Entrants need to apply by Fri 22 Dec 2017. Preliminary rounds will be held on Fri 16 Feb and Finals on Sat 17 Feb 2018. Judges Dan Laurin, Annabel Knight and Francesca Clements. To apply: Entrants must read the Competition Guidelines download, fill in and send theCompetition Entry Form and make an entry through Eventbrite. 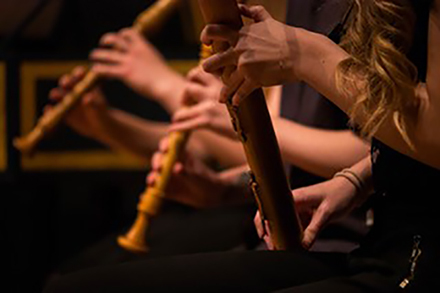 We are delighted to present a series of Recorder Masterclasses, open to all levels and ages, with our fantastic recorder experts, Chris Orton (tutor at the Royal Birmingham Conservatoire) and Michelle Holloway (tutor at the Royal Birmingham Conservatoire Junior Department). To register to play in a class, please follow the links below. Taster workshops for baroque instruments including harpsichord, flute, violin and oboe. No registration required. You can also check out the Royal Birmingham Conservatoire Recorder and Early Music Departments on Facebook, to get up to date news on all the events happening across the year!